There are a number of exercises you should master in order to improve your horses ability to bend laterally (sideways), his overall suppleness and encourage engagement of his hindquarters. One of them is Travers (or haunches in). This lateral exercise is where the horse moves on a straight line with the quarters on an inner track and is essential for those who have already mastered shoulder-in and are ready to move up to half-pass. You should begin asking for Travers in walk by ensuring that the walk is active with free and flowing movement. It is important to be conscious of this so that you do not lose the rhythm or tempo and the gait is not be impaired in any way as the Travers begins. Move your outside leg back slightly behind the girth to ask the horse’s hindquarters to move inwards to a 30 degree angle. The outside rein should balance the horse and control the bend. Ride a few quality strides only, straighten the horse and ride away until you are able to maintin Travers along the whole side of the arena. Ride shoulder in along long side to E or B, 10m circle followed by Travers for the rest of the long side. So, there you have it the do’s and do nots of Travers. Take it slowly, really think about your body position and how it affects the horse, be quiet in your aids and expect it to happen. Use Travers and Ranver aids to straighten your horse when you feel them crooked . In effect you are altering, by bending the natural curviture of the horse’s way of going into the opposite direction, and you will in the process arrive at a position of “STRAIGHT” when traveling foward either on the long straight side or on a circle. They will then be “straight ” on the circle. To do these excersises without employing the aids to obtain straightness is only to supple the loins ,which although desirable (it also provokes a soft chewing on the bit) the aids employed main raison d’etra, is to obtain Straight locomotion in all 3 gaits when crookedness creeps in. A progression on is to use these aids for a reverse pirouette in a Counted Walk to canter strike off. I concur. Your horse should be able to put his body wherever you ask easily and only with practice will you help your horse achieve this. Then of course these aids for Travers and Ranvers in locomotion in all 3 gaits will negate the effect of crookedness. Be mindful though of any Tridimensional rotation of the vertibreas in the lumber area. 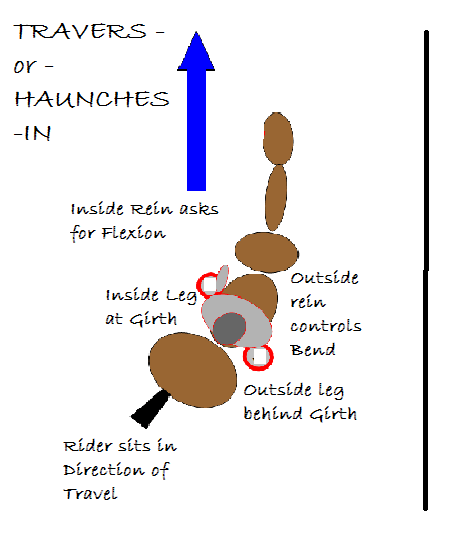 If your horse drops it’s right side as one of mine does , Hunches Out on the right rein might release the blockage, then you can try the Haunches In position on the right rein to obtain straight locomotion with a horse that is curved naturally to the right. Avoid “FORCING ” left bend in Half Pass Left before this issue is addressed as it is painful for the horse to do which is why the horse finds it difficult to do! Failing that chiropractic manipulation may be needed to release the subluxion. Thank you for your insights Keith, you clearly know a lot about the subject. Not really in keeping with my ‘keep it simple’ philosophy but always happy for ‘experts’ to engage with me on my site.